Site Templates can be administered from the Control Panel. They allow portal administrators to create multiple sites with the same default set of pages and content. Site templates can contain multiple pages, each with its own theme, layout template, portlets, and portlet configurations. Site templates can also contain content just like actual sites. This allows administrators to use site templates to create new sites that are each created with the same default pages, portlets, and content. After they’ve been created, these sites and their pages can be modified by site administrators. Using site templates can save site administrators a lot of work even if each site that was created from a given site template ends up being very different. To get started, click on Site Templates in the Portal section of the Control Panel. Here, you can add, manage, or delete site templates. You can also configure the permissions of site templates. As long as a site is linked to the site template it was created from, changes to the site template’s pages, portlets, and portlet configurations are propagated to the site. Changes to a site template’s content, however, are not propagated to existing sites that are linked to the site template. We discuss the propagation of changes between site templates and sites in more detail in the section on site templates use cases below. To manage the pages of a site template, click on Site Templates in the Control Panel and then click Actions → Manage Pages. From here, you can add or remove pages from a site template or select themes and layout templates to apply to the site template. Click on a specific page if you’d like to select a different theme or layout template for that page. To edit the pages themselves, click Actions → View Pages. You can add specific portlets to each page of a site template and configure the preferences of each portlet. Each page can have any theme, any layout template, and any number of portlet applications, just like a page of a regular site. As with site pages, you can organize the pages of a site template into hierarchies. When you create a site using a site template, the configuration of pages and portlets is copied from the template to the site. By default, all changes made to the site template are automatically copied to sites based on that template. Tip: If you want to publish a piece of web content to many sites and ensure modifications are applied to all, don’t use site template content for that purpose. Instead, place the content in the global scope and then reference it from a Web Content Display application in each site. Community Site: Provides a preconfigured site for building online communities. The home of a community site provides message boards, search, a display of a poll and statistics of the activity of community members. The site will also be created with a page for a community calendar and a page for a wiki. Intranet Site: Provides a preconfigured site for an intranet. The Home page displays the activities of the members of the site, search, a language chooser and a list of the recent content created in the intranet. It also provides 3 additional pages for Documents and Media, Calendar and external News obtained through public feeds. To view and manage the pages of a site template, click the Open site template link. This opens the template in a new browser window (or tab) and it can be navigated or managed like a regular site. Suppose we need to create the following three sites for Nose-ster’s internal use: Engineering, Marketing, and Legal. These should be private sites that are only accessible to members of these respective departments. We could design each site separately but can save ourselves some work if we create a site template to use instead. To create a site template, navigate to the Control Panel and click Site Templates. Then click Add and enter a name for your template: we’ll use Department for our example. 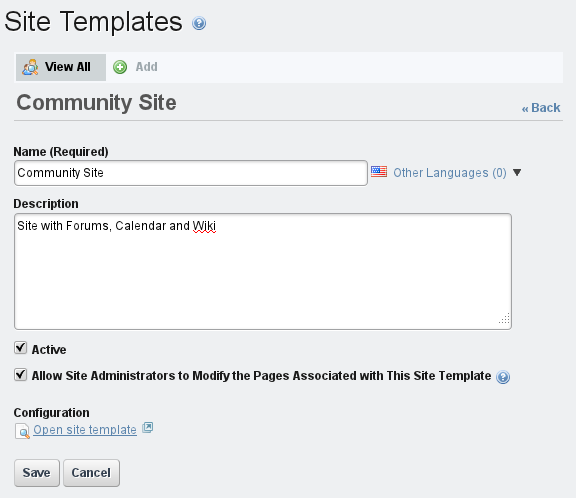 Leave the Active and Allow Site Administrators to Modify the Pages Associated with This Site Template boxes checked. The Active box must be checked for your template to be usable. If your template is still a work in progress, you can uncheck it to ensure that no one uses it until it’s ready. Checking Allow Site Administrators to Modify the Pages Associated with This Site Template allows site administrators to modify or remove the pages and portlets that the template introduces to their sites–if you want the templates to be completely static, you should uncheck this. From the list of site templates, click on the Department site template that you created. Then click on the Open site template link to begin adding pages and portlets and configuring the layouts. When you click this link, the site template opens in a new browser tab or window. For our example, we would like our site template to include four pages. First, we’d like a Home page with the Activities, Announcements, and Calendar portlets. Next, we’d like a Documents and Media page with the Documents and Media portlet. Finally, we should create a Wiki page with the Wiki and Tag Cloud portlets and a Message Boards page with the Message Boards and Tag Cloud portlets. When you’re done creating and configuring the pages of your site template, just close the browser tab or window that opened when you clicked Open site template. Changes to site templates are automatically saved as you make them, so you don’t need to return to the Site Templates page of the Control Panel and select Save. Next, let’s use our site template to create our Engineering, Marketing and Legal sites. Go to the Control Panel and click on Sites. Then click Add → Department. Enter Engineering for the site name and set the Membership Type to Private. Recall that private sites don’t appear in the My Sites portlet so that regular portal users won’t even know that the Engineering site exists. Also, the only way users can be added to a private site is via an invitation from a site administrator. Leave the Active box checked so that your site can be used immediately. Select the Copy as Private Pages option since our Engineering site is intended for internal use only. Leave the Enable propagation of changes from the site template box checked so that the Engineering site receives updates if the Department site template is modified. Finally, click Save to create your the Engineering site. Repeat these steps to create the Marketing and Legal sites. The new sites have all the pages and portlets you created in the site template. To view the pages of the new sites, click on Sites in the Control Panel and then click on Actions → Go to Private Pages next to one of your new sites. Using site templates streamlines the site creation process for administrators, making it easy to create sites quickly. Now each Nose-ster department has its own calendar, documents and media library, wiki, and message boards application. Although the pages and portlets of each department’s site are the same, each site will quickly be filled with department-specific information as users add and share content within the sites. Also, site administrators can add new pages, portlets, and content to their sites, further differentiating each department’s site from the others. It’s possible for site template administrators to add, update, or delete site template pages. Changes made to a site template can be propagated to sites whose pages sets are linked to the site template. Such a link is created when you create a site based on a site template and leave the Enable propagation of changes from the site template box checked. To disable or re-enable this link for a site, select the site in the Control Panel’s context menu selector. Then click on Site Settings and uncheck or recheck the Enable propagation of changes from the site template checkbox. You can can also access the Site Settings interface via the Dockbar by clicking Manage → Site Settings. In this section, we explain the propagation of changes from site templates to sites and discuss the options available to site administrators and site template administrators. If a site’s page set has been created from a site template and the propagation of changes from the site template is enabled, site administrators can add new pages but cannot remove or reorder the pages imported from the site template. If a site has both pages imported from a site template and custom site pages, the site template pages always appear first; custom pages added by site administrators appear after the site template pages. Only site template administrators can remove, reorder, or add site template pages. Site administrators can add or remove custom site pages. They can also reorder custom site pages as long as they’re all positioned after the site template pages. Site template administrators cannot add, remove, or reorder custom site pages. overwrite the changes and receive updates from the site template. If the site administrator clicks the Reset button, changes are propagated from the site template page to the corresponding site page that was imported from the site template. Clicking the Reset button makes two kinds of updates to a page. First, changes made by site administrators to the site page are undone. Second, changes made by site template administrators to the site template page are applied to the site page. Note: clicking the Reset button only resets one page. If multiple site pages have been modified and you’d like to re-apply the site template pages to them, you’ll need to click the Reset button for each page. Site template administrators can set preferences for portlets on site template pages. When a portal administrator creates a site from a site template, the portlet preferences are copied from the site template’s portlets, overriding any default portlet preferences. When merging site template and site changes, e.g., when resetting, portlet preferences are copied from site template portlets to site portlets. Only global portlet preferences or local portlet preferences which don’t refer to IDs are overwritten. Site administrators can also add data to site template portlets. For example, site template administrators can add the Wiki portlet to a site template page and use the Wiki to create lots of articles. When a portal administrator creates a site from a site template, data is copied from the site template’s portlets to the site’s portlets. The preferences of the site’s portlets are updated with the IDs of the copied data. For example, if a site is created from a site template that has a Wiki portlet with lots of wiki articles, the wiki articles are copied from the site template’s scope to the site’s scope and site’s Wiki portlet is updated with the IDs of the copied wiki articles. Portlet data is only copied from a site template to a site when the site is first created; data is not copied copied during a site reset. Now that we’ve learned how site templates work, let’s discuss how to use page templates.